Curious seating arrangement on a schoolbus. Don’t be afraid to experiment with different seating arrangements, even within a single lesson. A quick seating change can increase motivation and make activities run more smoothly. In fact, a little time spent on rearranging the furniture at the start of a course can lead to more effective activities throughout the year. There are many ways you can arrange the desks in a classroom to make the layout as appropriate as possible to your lesson and different set-ups allow for different types of learning. You can usually get the students to help you and as long as you give the instructions in English‏‎ it’s all good language practice! Rows are the typical environment for a teacher centered classroom and/or individual learning. Students are aligned in such a way so they all face the front of the class. The teacher conducts the instruction from this ‘front’ position. This type of physical set-up is regarded by some as helping classroom management as the teacher can see all the students nearly all the time. The traditional classroom layout in rows allows the teacher to make eye-contact with all the students (although it is important to keep looking around to move beyond a narrow arc of vision, if you want everyone to feel included). The students can also readily see a screen or board at the front. But in order to talk to each other, they need to turn in their seats or address the back of a fellow-student’s neck. Although many schools still use traditional rows as you can pack in lots of people in a small space, there are very few advantages for a language teacher. If students are sitting in twos you have immediate pairs made for pair work‏‎ but as you will probably want to change the pairs at some point this is only a limited advantage and if you can’t get around behind the students to look at their work it can be really difficult to monitor. If you have to work in this layout think about the spaces at the front of the class and the aisles between the rows. For mingle tasks make use of these. Look for alternative spaces for certain group tasks, such as the corridors, playground or halls. If rows are indicative of a teacher-centered approach, groups are typical of student centered learning. They provide an effective environment for students to actively engage with the learning process. Grouping can help with integration of different kinds of students so you have the chance to mix everything up. The following are some of the main student-centered layouts. Typically tables are arranged in small squares or rectangles with 4-6 seats around them. Nested tables are great for small group work and project work. It can be difficult to start classes when students are already sitting on small tables as some students will have their backs to you. If possible have the students sit so they’re side-on to you and remember to move around the classroom when you need to give instructions‏‎ or change activities. Surprise your class by popping up at different places around the class! The circle formation is great for many games, group discussions, welcoming your students at the beginning of the class, taking the register and really talking to your students. You should push the tables to the walls and have just the chairs in a circle. You can sit in the circle with your students. If they need to write at certain times of the lesson they can either go to work at the tables facing the walls around the outside or they can rest a folder on their knees and stay in the circle. Another set up that does not include tables is the theater layout. This layout is useful if you are planning on giving a lecture or an OHP presentation. Chairs can be arranged in a chevron (a wide V) to increase visibility. This layout is great if you are using visual aids, doing board work or speaking‏‎ activities like whole-group discussion. All the students will be able to see you, the board and each other and you will have a large space in the middle of the horseshoe and around the outside to monitor your students’ work, distribute handouts etc. 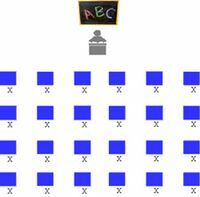 Breaking the group into pairs or dividing the students into 2 large groups can be easy with this set-up. Placing rectangular tables up against each other to create a large rectangular table and then arranging the seats around the perimeter is called a boardroom set-up. The shape can also take the form of a solid or hollow square. This set up is ideal for debates or when students need to act as one group to make decisions and discuss content. If the group is too large to get around a U-shaped layout or a board-room table, the “fishbowl”, with concentric circles of students, maximizes the possibilities of discussion. Clearly this works better without tables, and it is useful to make efforts to ensure that over several sessions, everyone has their turn in the “inner circle”. For sessions involving small group working, it is useful to arrange tables at which four or five students can sit, to promote the easy formation of the small groups from the start of the session. It avoids the disruption caused by people moving about half-way through (although that is sometimes a useful “punctuation mark” in the session). Classroom Focus – focusing the classroom on the students and not the teacher. For my Level One class of adults, learning English, do you have any suggestions? Circle formation or a very wide horseshoe work best, to make everyone feel included and to allow all students to see the board, but with 40 students, we don’t have enough space for either of those formations. Forty students is a huge amount in one class! Can you break them down into smaller groups perhaps? Or make the arrangement into some kind of activity?